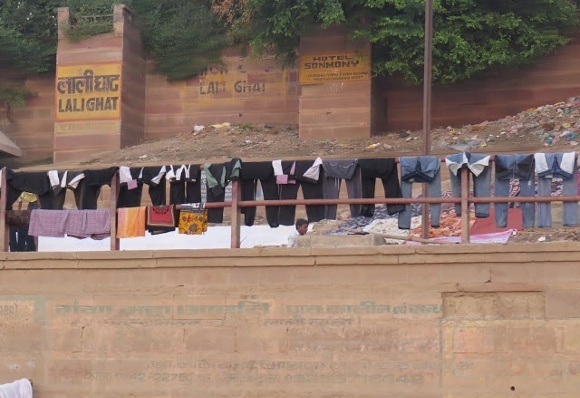 Janet and Len Wheeler from Perth Australia, recently experienced a private, hassle-free tailor-made trip to India, with Varanasi as one of their many destinations. 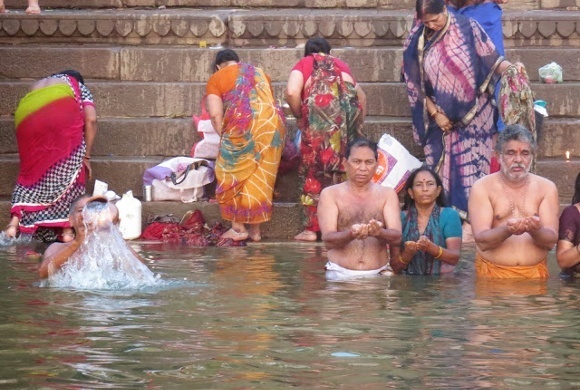 Here, they elucidate highlights from their unique visit to one of Hinduism’s seven holy cities – uncompromisingly disorderly, unabashedly lacking in decorum and a riot of colors! We were told by our guide in Agra that there was no in between with Varanasi…we would either love it or hate it. We went with an open mind, not knowing what to expect, but knowing it would probably leave a lasting impression in our minds. We flew from Delhi, which took just over an hour. From the air the land looked very green, fertile and well laid out. The airport is sparkling new and of a good size. We were met on arrival by a porter who identified himself and quickly escorted us outside to meet our Enchanting Travels driver and guide. 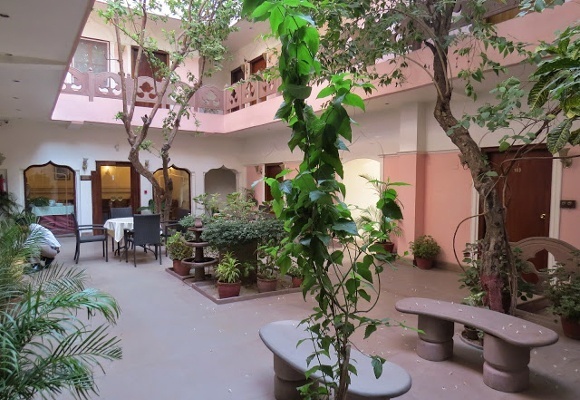 Before we left Australia, we had settled on a hotel right on the ghats called Suryauday Haveli. We did not see the point of going all the way to Varanasi only to stay miles away from the ghats. We knew the hotel was vegetarian, and also seeing as it was on the ghats, no alcohol would be served. Being Australian, the latter was pretty important to us, so on the long drive in from the airport (around 90 minutes) we asked our guide to stop at a bottle shop to buy some beer which could be consumed in our room. Our guide did all of the negotiating and our cold beer was packed in a box and off we set again. As we got close to the hotel, we were given the choice of either traveling there by boat or walking through the alleyway to the hotel. Our guide was keen for us to travel by boat, so we went with his decision, not even thinking about how we would get our suitcases down onto the boat (which was very small), let alone our beer! No problems, porters appeared from nowhere and our bags and beer were hoisted on top of their heads and off they walked towards the boat with us trailing behind like Kings and Queens! With everything stored safely on board, we set off along the Ganges to our hotel. 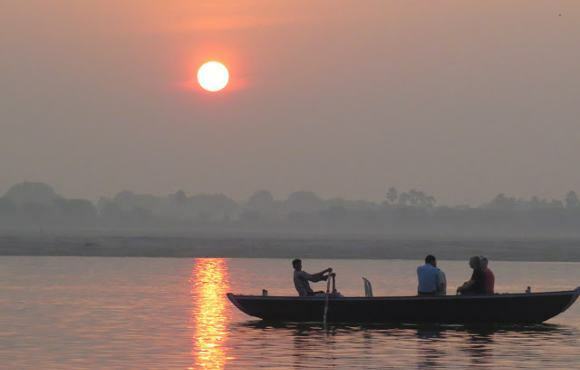 Traveling on the Ganges, we both instantly knew that we were going to love Varanasi. There is so much activity around you, leaving you not knowing where to look first. We received a lovely welcome from the hotel management and staff, and our room was perfect. It was a corner room with full views of the Ganges. We had most meals at the hotel (we were there for 3 nights) and they were all great, so meat eaters, don’t let the fact that it is vegetarian put you off. Don’t miss the sunrise boat tour. It’s an early start but well worth it. It was so quiet, calm and cool, with so many pilgrims making their way down to the Ganges. The sunset tour is also a must do, but has a totally different atmosphere. 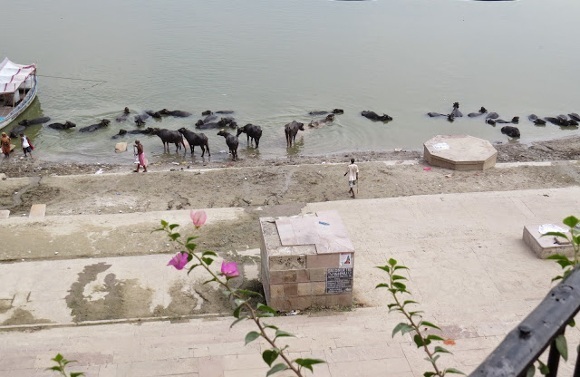 During the day from our room, we could watch water buffalo lolling around in the Ganges waters all day, while locals taking care of their laundry was also amazing to watch. Given the chance, we would go back, as I feel we only just scratched the surface. 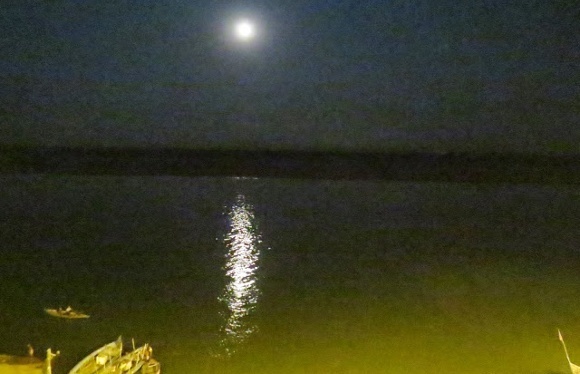 There is so much to see and so much to learn in Varanasi…and yes…we loved it! Would you too like to discover Varanasi like the Wheeler’s did and decide what’s to love or hate about the place? Does walking along the ghats, taking a boat ride on the Holy Ganges, meditating to the jingle of the aarti bells or simply watching local life as it is on the river banks intrigue you? Then contact us at Enchanting-Travels.com to help you personalize your very own tailor-made trip. No matter the experience, i’m sure every one experiences the tranquility of Varansi as part of their journey.